A relentless pursuit for impact – that’s the most encompassing explanation of how we spend our time at Aptus. What does that look like in the investment world? A consistent and disciplined all-out assault on the behavior gap. In hindsight, the gap and wealth zapping side effects are clear and regular. The contributing behavior will camouflage itself in justification that morphs with market movements. In rising markets, it looks like performance chasing and feels like FOMO. In falling markets, it looks like performance chasing and feels like panic. Notice the repetition of performance chasing…it’s the one thing we have learned to count on in all environments. The world of invested assets is huge…we’re talking numbers that start with the letter “T”. If we can improve outcomes for just a small piece of that, that ripple effect will be felt by investors and the people that matter most to them for years to come. That’s the goal – maximum impact. 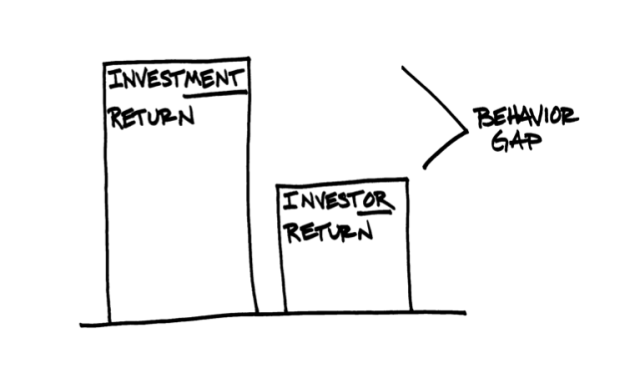 To define and illustrate the Behavior Gap, let me turn to the guru, Carl Richards: the behavior gap explains the difference in investment and investor returns. For example, it is the percentage difference between a fund’s stated returns and the returns that individual investors actually get. It’s this gap we want to chip away at. The stock market is a proven vehicle for long term wealth accumulation. It’s simple, just buy and hold. As we’ve said before, if only it were. Long term evidence is easy to disregard when your present day savings are being whipsawed by volatility. When faced with uncomfortable short term results, we are quick to trade in what we want most for what we want now. That’s human nature buried in all of us. We can’t eliminate that, but through relationships with our advisors, we can reduce sub-optimal behavior. Education and differentiated return streams within a sound overall asset allocation, is our weapon of choice. We want to deliver return streams more palatable to investors – how you get from point A to point B matters. Impact Everything – that’s the goal. When it comes to investing, that means attacking the gap. We hope this post will better define the gap and encourage the growing number of folks building tools and services to close it. Thanks for reading, and please keep in mind – Simple beats Complex.